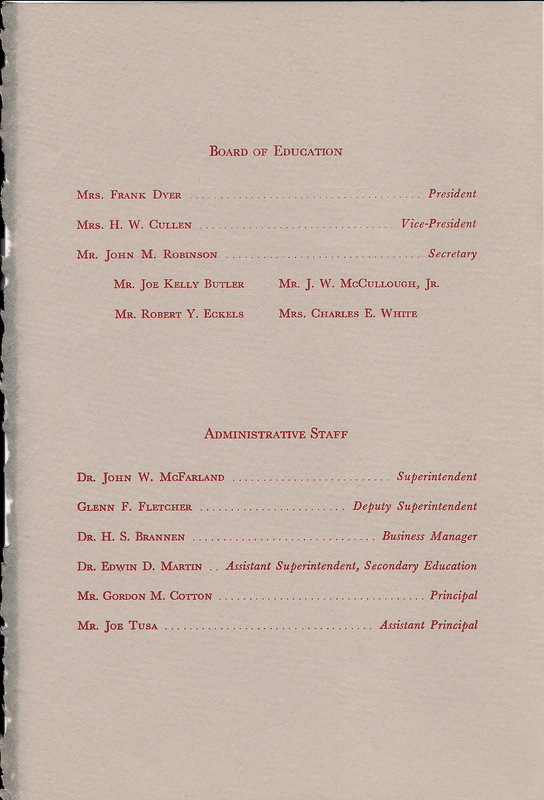 Under the direction of Principal Gordon Cotton, S.P. 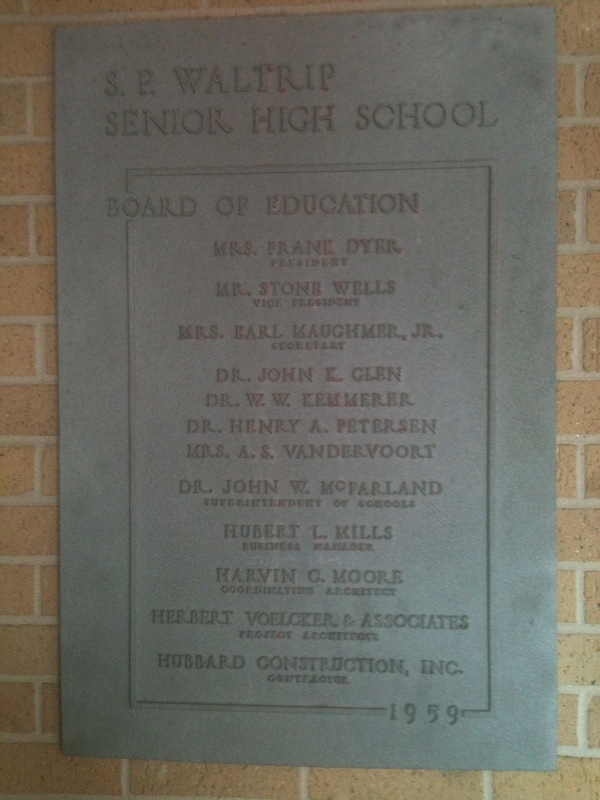 Waltrip High School opened on September 6, 1960, with the student body’s central theme "What have you done for liberty? If nothing, what can freedom mean to you? “This theme is very much central to the character and values instilled by our namesake, Mr. S.P. Waltrip. The belief in patriotism has always been held in high regard at Waltrip and this can be seen in the organizations being formed the very first year and continue until today. Organizations such as the National Defense Cadet Corp or today, we know it as the JROTC. They have won many honors throughout the years. 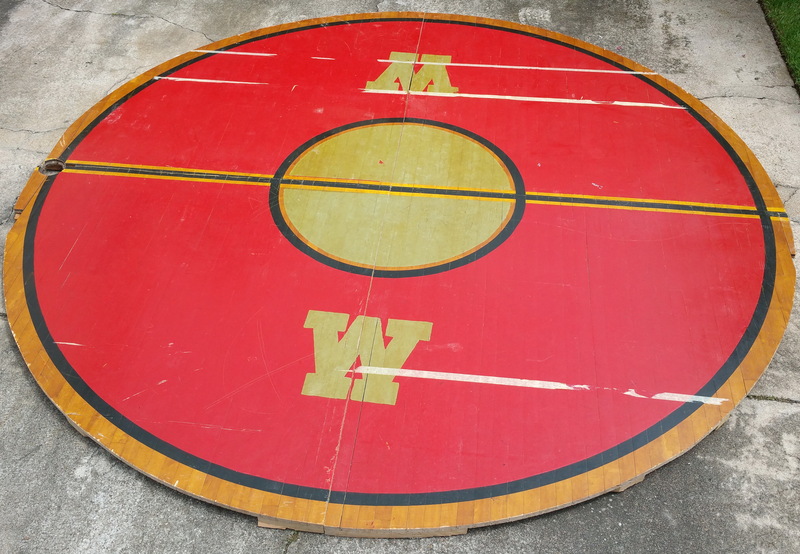 The Original Center Court from the Boy's Gym that was installed in 1959! 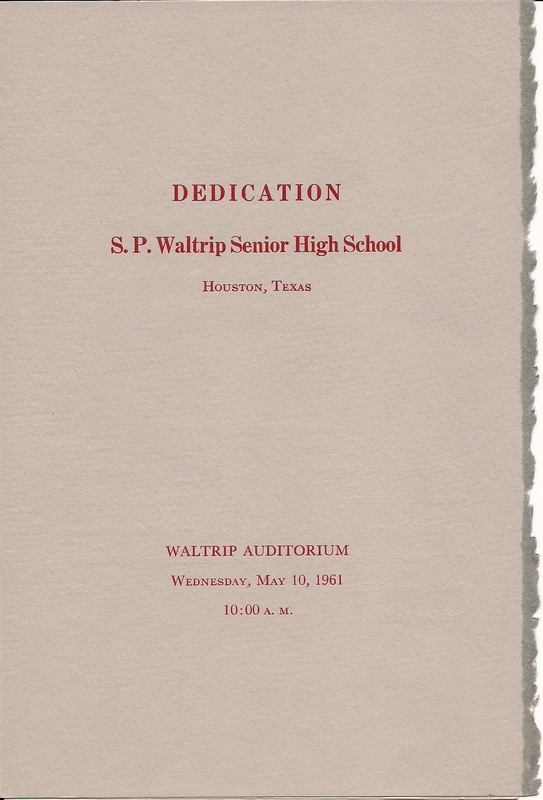 The formal dedication of Waltrip Senior High School was held on May 10, 1961. 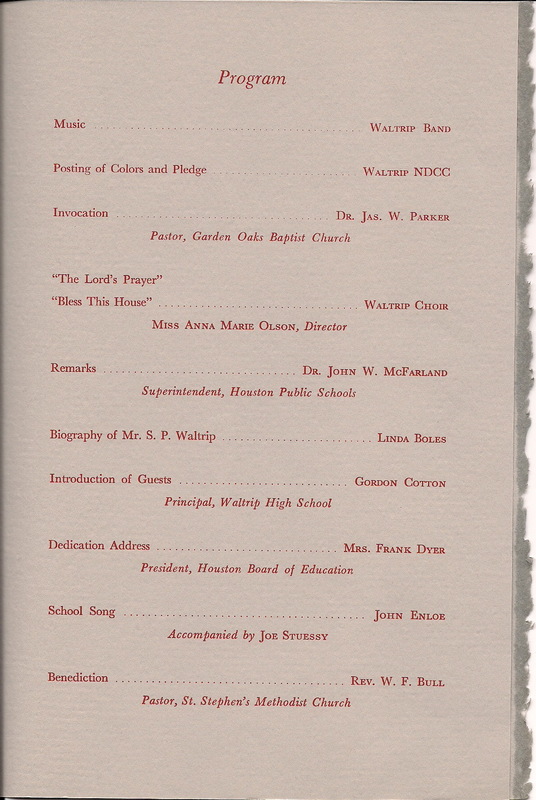 Thanks to Linda Boles Frazier '61, we have an original program from that dedication ceremony. The 1961 graduates’ patriotism ran high those early years as many young men graduated and served their country through one of the most turbulent times in America. We had numerous service and leadership organizations the very first year as well as academic and fine art achievements. That very first year, we had state and national honors in debate, national merit scholars and the band was voted the city’s ‘best marching band’ with only 56 members. 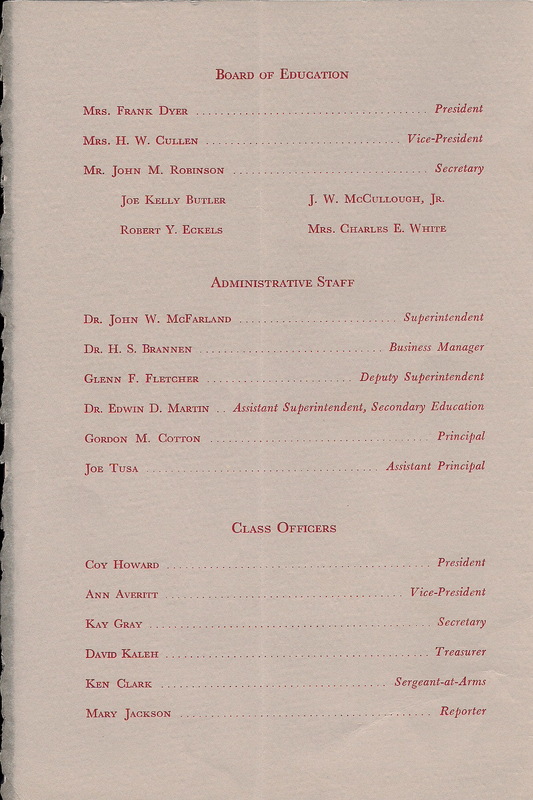 The program for the first graduation ceremonies for the class of '61 has been donated by Linda Boles Frazier '61. We are eternally grateful to Linda for giving this historical program to our alumni association. Throughout the 1960’s the Spirit of Leadership theme, led the way forming the ‘W’ Association with many more academic and fine art honors, we had our first exchange student from Germany. Athletics kept building their programs and both the boys and girls teams success on the field was seen and Waltrip won the Sportsmanship award consistent basis. 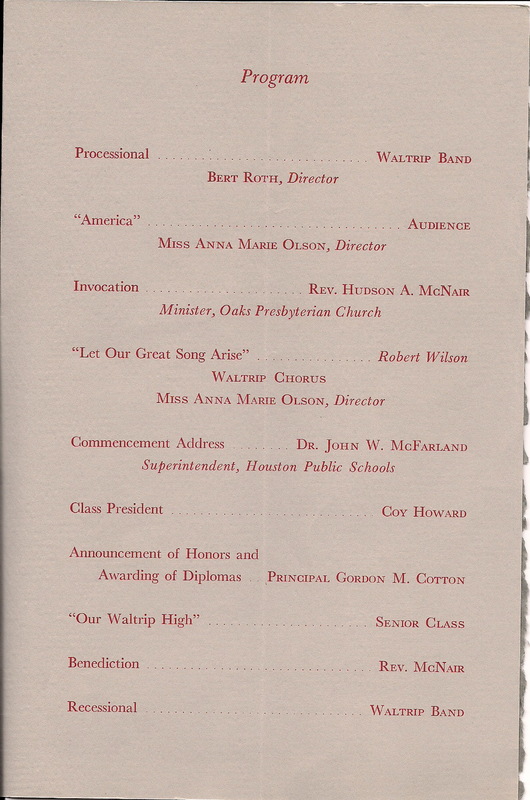 In 1966 as a new wing is opened at Waltrip. Pep rallies were held on the porch roof and Waltrip was taking its place in the academic and athletic world. In 1967, there were National and State Honors for the Choir, City Football and Basketball Championships and Golf District Championship. The only high school in Houston to win all in the same year! 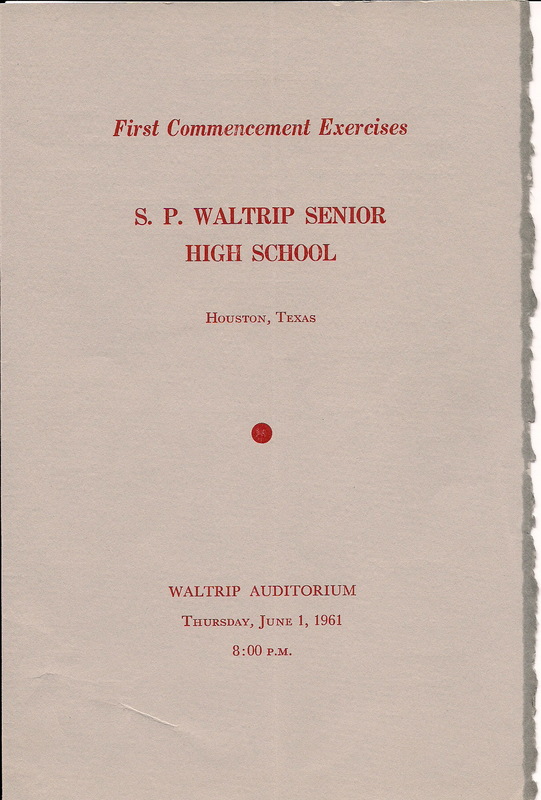 By 1968, Waltrip was consistently begin recognized academically with national merit scholars and debate and this year a student won the National Singer Sewing and we had our first National All-American First Team, Football member. In 1969, politics became center at Waltrip as now President George Bush, ’41, spoke to the student body. The 1970’s started out with a bang as zoning in HISD became law and many Waltrip students were made to attend other schools; now Waltrip not only had a rivalry with Reagan but also with Scarborough. 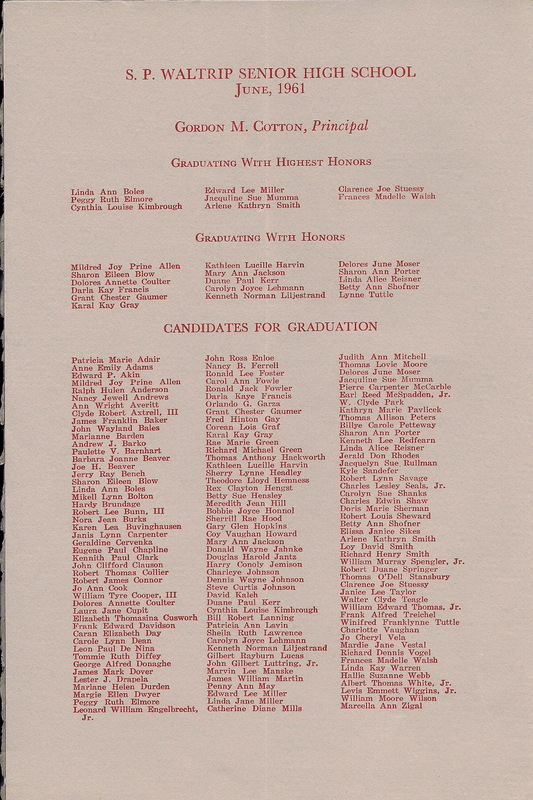 America was in turmoil and the 1971 graduates were about getting involved and participating, while 1972 centered on expression/impression: be yourself; The Class of 1972 has the distinction of having the largest number of graduates from Waltrip, with 762 seniors. By 1973, the student body was awakening to come in contact with the world. Transparent windows, observers of time and visions for the future characterized much of this decade. Throughout 1976, the bi-centennial of our country was celebrated at Waltrip; the Imperial Guard added an officer just for this event. A state of change for Waltrip began in 1980’s as the graduating classes became smaller but the character remained true. Challenges bring out the best sometimes and Waltrip is no exception as academically and athletically our spirit was flying high. The school struggled in many ways in the 1990’s as the graduating classes continued to decline with the class of 1998 being the smallest with 128 seniors. Although there were educational challenges as the socio-economic downturn became a significant aspect of the student body, their character and ability to dream and take action during this time brought more foreign exchange students from Brazil, Australia and New Zealand and established the tradition of the Homecoming Parade. In 2000, Waltrip held tight to traditions as they began to march out of their struggles toward the re-ownership of the foundations that made Waltrip High School graduates feel proud. Waltrip again began to hit their academic stride becoming recognized by TEA in 2001 for the academic accomplishments and again in 2008, 2009. In April 2010, we ranked 4th in Best Urban High School for Low-Income Students in Texas and in the Top 6% of High Schools in America. Waltrip is one of only 6 HISD Comprehensive High Schools in HISD to achieve TEA Recognized Status. As life is choices on the road, we must ‘buckle up’, as we dream, think and achieve as S.P. Waltrip stands for freedom, liberty, brotherhood and patriotism. These values are emboldened in our seal: Truth, Honor and Integrity. May all 22,440 graduates of Waltrip continue to grow with “Ram Pride!” and may our abilities affect change in the lives we lead, the families we care for and the communities we serve.